Have you ever seen a cat on catnip? She might go absolutely crazy for the stuff: rolling around in it, running around the house at top speed, drooling, leaping at your hand if she smells catnip on you at all, or maybe just zoning out completely. Some cats will even get really aggressive and protective of their catnip toy if they think you might take it away from them. Catnip drives some cats absolutely crazy – but why? And why do some cats seem to not care about catnip at all? Catnip is an herb called Nepeta Cataria, which is part of the mint family. It has heart-shaped leaves and in the wild, it can grow up to three feet tall. It has small flowers that can bloom in a white, blue, lavender, or pink color. It grows wild in North America, but was originally imported here. The plant is native to Europe, Asia, and Africa. It’s fairly easy to grow yourself. When the leaves are broken, it releases a chemical called nepetalactone, which cats respond to. If you crush catnip between your fingers before you rub it on a cat toy or a scratching post, it will have more of an effect because you’re releasing the chemical’s scent more strongly. The scent of catnip has the strongest effect on cats. A recent study by the American Chemical Society found that the nepetalactone in catnip binds to the olfactory receptors in a cat’s nose and triggers a euphoric neurological response. 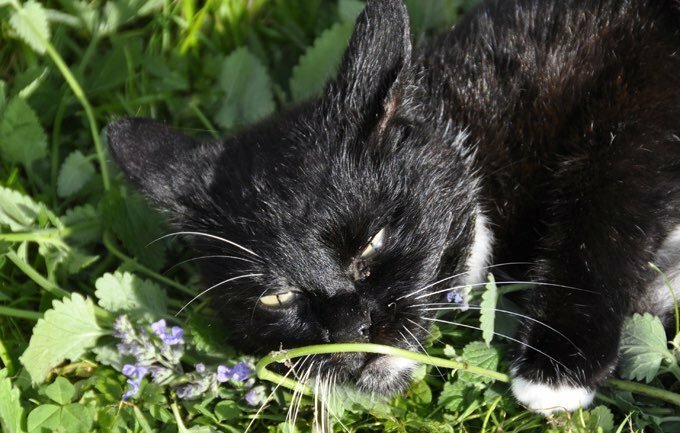 Experts aren’t sure, however, exactly why catnip triggers such an emotional response. Some scientists think the smell mimics a happy pheromone and cats’ brains react accordingly, according to The Humane Society. Some cats, however, will become aggressive rather than euphoric when they smell catnip, due to a different reaction to its stimulant effect. Ingesting catnip also impacts cats, but not as strongly as smelling it. When eaten, catnip tends to make cats mellower rather than happy. Why Don’t Some Cats Like Catnip? Sometimes, you’ll have one cat that goes crazy for catnip and one cat that doesn’t care for it at all. That’s because only some cats are actually sensitive to catnip. A sensitivity to catnip is inherited and experts estimate that about 50 to 70 percent of cats will respond to catnip. But the response isn’t limited to domestic felines. Big wild cats, like lions and tigers, may have this sensitivity too! Did You Know that Humans Are Susceptible to Catnip? Humans can be emotionally affected by catnip too, although not as strongly as cats are! Catnip is more of a sedative for people. When used in tea, it can be kind of like chamomile. The sedating effects can also sometimes help with headaches, nausea, or toothaches. In a concentrated form, it may repel mosquitoes and other bugs, but it doesn’t last as long as store-bought repellents and some experts say that it loses its effectiveness when applied to the skin. Catnip is a safe product for your cat, but if you have a multi-cat household you should probably introduce each cat to it for the first time individually. This is just in case you have a cat that turns anxious or aggressive instead of happy when exposed to catnip. The effects of catnip only last about 5 to 15 minutes. If you find that your cat likes catnip, you can buy toys and even scratching posts that are infused with it and reward your kitty with an unexpected catnip treat.